See the main sights of both Kyoto and Nara in one day! 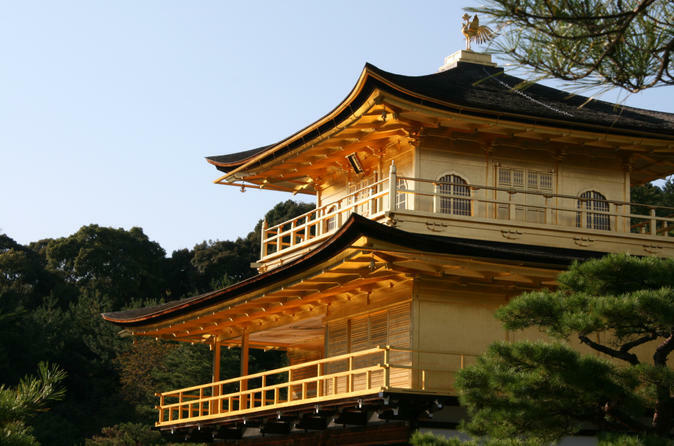 This day trip from Osaka takes you on a morning tour of Nijo Castle, Kinkaku-ji Temple (Golden Pavilion), Kyoto Imperial Palace and Kitano Tenman-gu Shrine. After a Japanese lunch, visit landmarks in nearby Nara, home to Kasuga Shrine and the impressive Great Buddha of Todai-ji Temple. Upon hotel pickup, your guide will accompany you by motor coach, JR Rail and Kintetsu Rail, and inform you about the cultural treasures in each historical capital. This is a day trip from Osaka to Kyoto, Nara and Kobe. 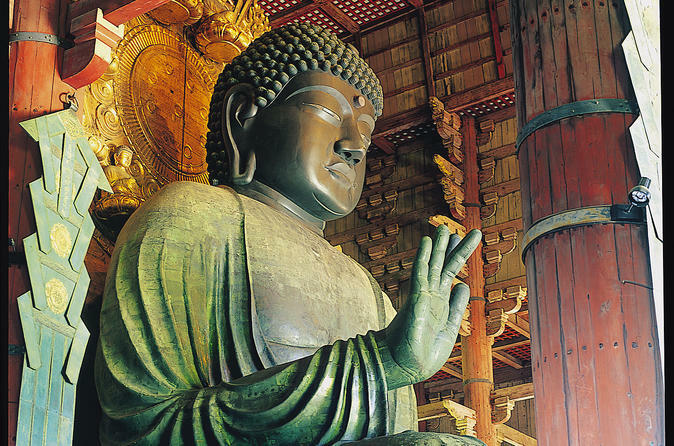 Tour sites you will visit include: Kyoto Arashiyama, Kinkaku-ji, Nara Todaiji Temple and Park, and the Kobe MOSAIC. 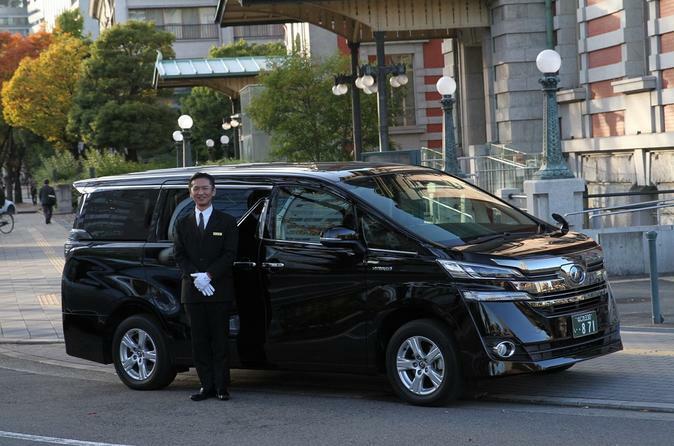 With convenient pickup near hotels located in Umeda and Namba, your trip will be culturally-enriching, but also easy! Tour Kyoto’s famous landmarks all in one day, traveling by rail from Osaka! 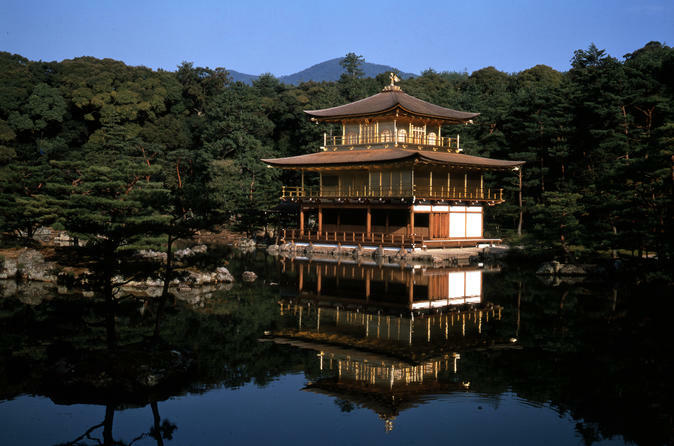 Visit three UNESCO World Heritage sites in the former royal capital, including Nijo Castle, Kinkaku-ji Temple (Golden Pavilion) and Kiyomizu Temple. You'll observe classical Japanese life in the elegant gardens of Heian Shrine, explore the Kyoto Imperial Palace and view 1,001 Bodhisattva statues at Sanjusangendo Hall. A local guide offers informative commentary throughout your day trip, including lunch, until you return to Osaka by train. 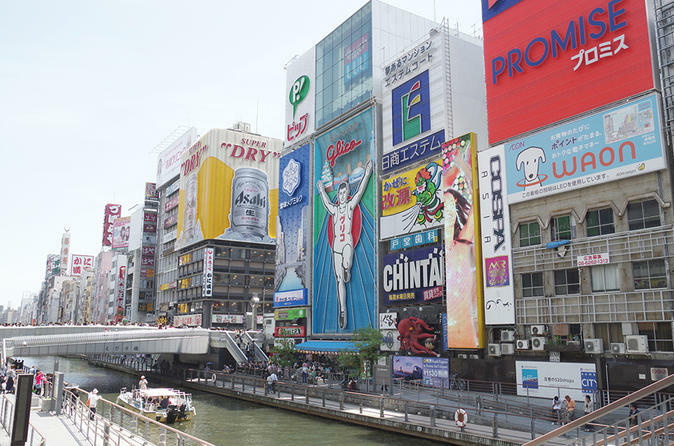 Go for a stroll through Osaka and see its highlights on this guided walking tour, including a 1-hour river cruise on the Aqua Liner. You'll enjoy lunch and visit Osaka's famous attractions with a knowledgeable guide, such as Osaka Castle and the Floating Garden Observatory. 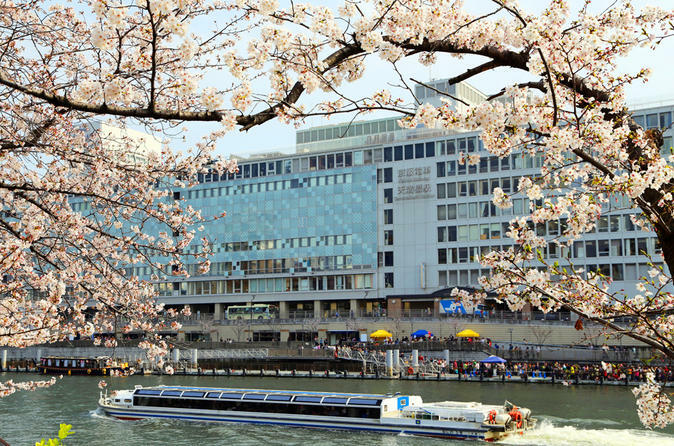 From the river, view the Twin Towers and City Hall on Nakanoshima lsle, and enjoy sweeping views all the way to Awaji Island from the Umeda Sky Building. See and experience the unique and fun Osaka in 3-hours! 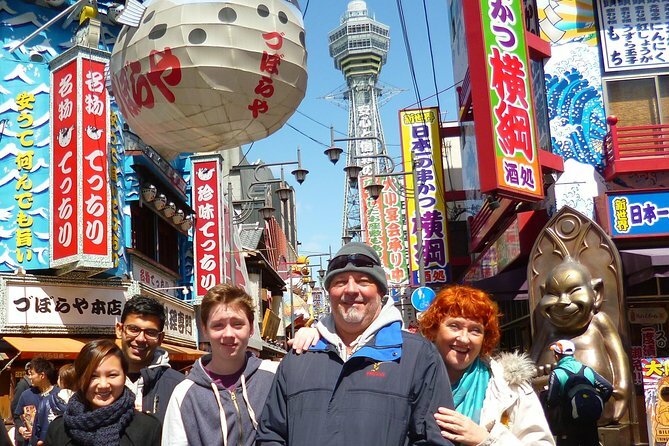 You will have a chance to walk through nostalgic neighborhood, eat delicious Osaka local food and meet fun locals! 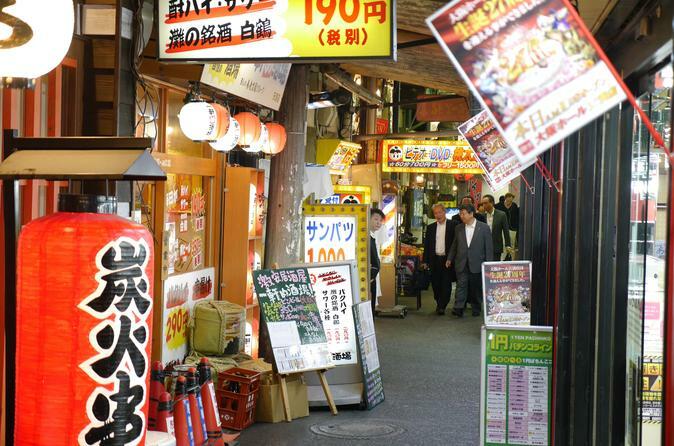 Combine the best of Osaka on this half-day walking tour in the afternoon. 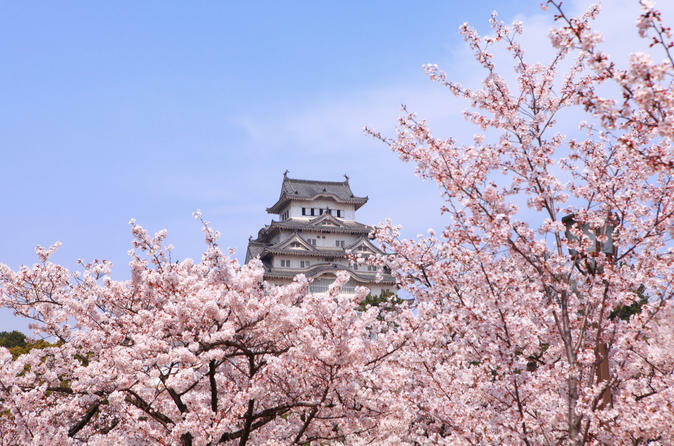 With your expert and friendly guide, explore Osaka Castle — the city’s best-known sight that is especially popular during cherry blossom season. Then take a 1-hour river cruise on the Aqua Liner, a pleasure boat with panoramic views including Osaka Castle, Umeda Sky Building and City Hall on Nakanoshima lsle. 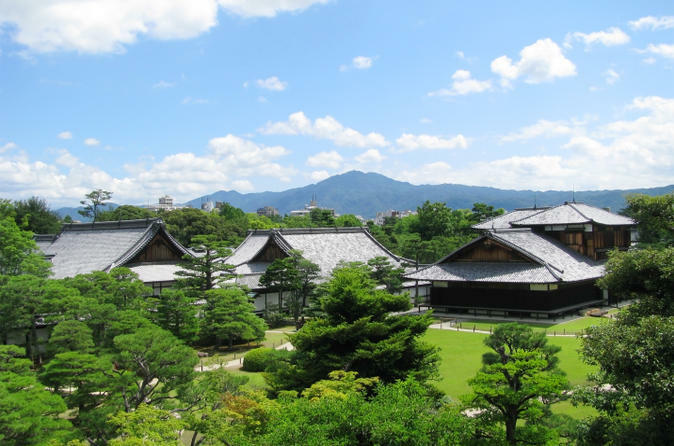 See Hiroshima’s historic sites on this 13-hour tour from Osaka. 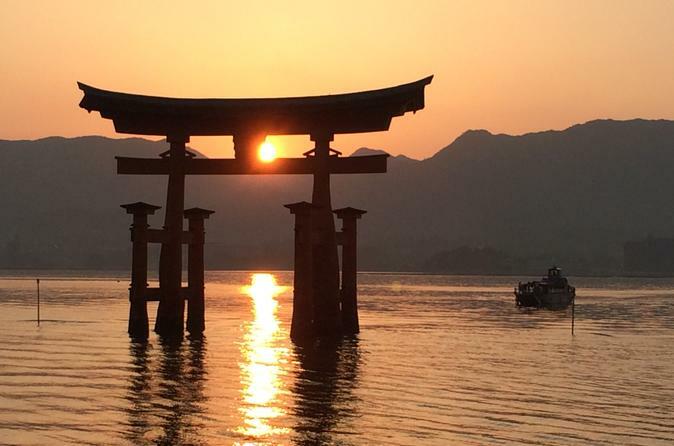 Ride a bullet train to Hiroshima and then a boat to Miyajima Island, where you’ll see the majestic Itsukushima Shrine. Then head back to Hiroshima to visit the Hiroshima Peace Memorial Park and Museum and explore exhibits that include remnants from the day the atomic bomb was dropped on the city in 1945. 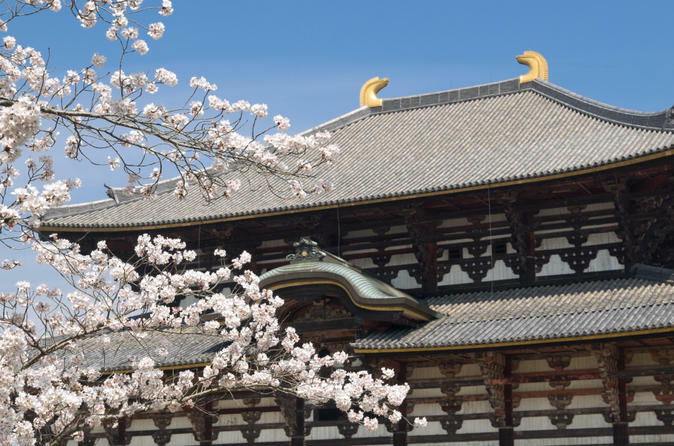 Enjoy an afternoon visit to Nara, whose combined historic monuments make the ancient city a UNESCO World Heritage site. This imperial capital from the 8th century is full of cultural treasures, including some of Japan's oldest Buddhist temples. Ride the JR rail from Osaka to Kyoto, where you’ll transfer by comfortable coach to Nara. After your tour of Todaiji Temple, Deer Park and Kasuga Shrine with a knowledgeable guide, you’ll return to Osaka by train. Learn how to make Japanese dishes with an informative Japanese cooking class in Nishinomiya city(between Osaka and Kobe). Mondo-yakujin station is a very close to central Osaka,only 15～20 min by Umeda/Osaka(Osaka main station) to here by hankyu train. learning many other techniques that are essential to making delicious Japanese food at home. You’ll also cultivate a deeper appreciation for your meals in Japan. The small group setting, with a maximum of six participants, ensures that you’ll receive personal attention. 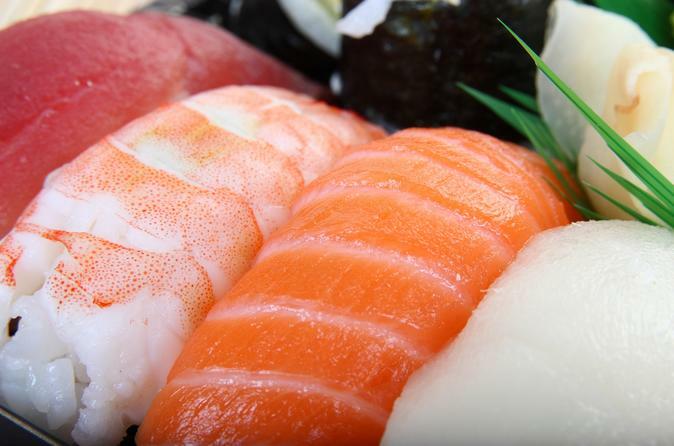 Learn one of Japan’s most popular culinary arts, sushi-making, during this afternoon class in Osaka. You'll churn out rolls like a pro under the guidance of a local professional and licensed chef. You'll also learn how to make Taiyaki for dessert. After the 2.5-hour lesson, enjoy dinner with your small group, which is limited to six people to ensure an intimate experience. Upgrade to include a sampling of Japanese sake (rice wine) or local beer. 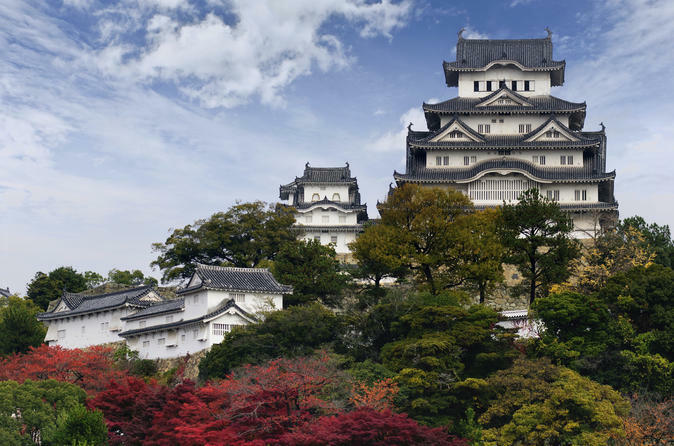 This full-day walking tour takes you to one of Japan’s national treasures: the UNESCO World Heritage-listed Himeji Castle. Leave by rail from Osaka for a visit to the 16th-century castle walls built to resemble a white heron, and enjoy a lunch buffet. A knowledgeable guide also takes you to the Akashi Kaikyo Bridge, the longest suspension bridge in the world, where you can stroll the Maiko Marine Promenade for scenic views. 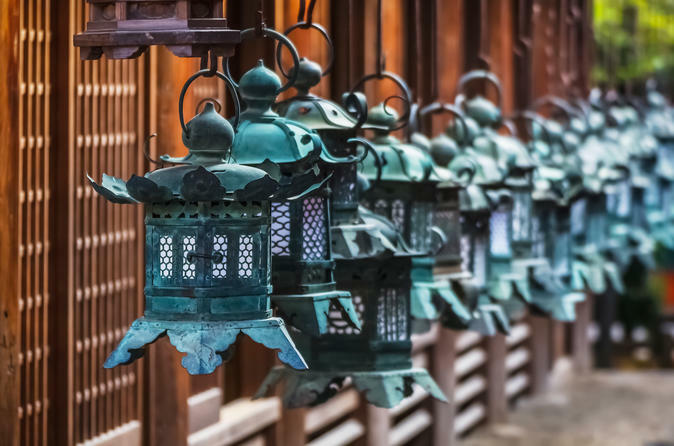 Discover the World Heritage-listed Kyoto and visit the must-see sights in a day! 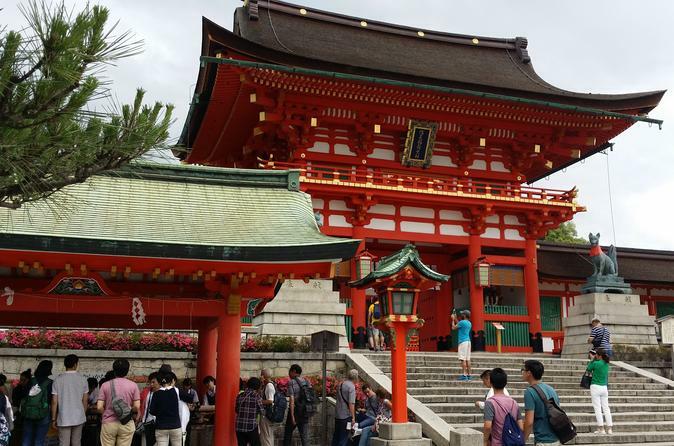 Travel on an air-conditioned coach on this 9 to 11-hour tour and get the chance to visit, Kiyomizu-Dera temple, Sanju-san-gen-do Temple, Fushimi Inari Taisha Shrine -Senbon Torii-, Arashiyama and more. Enjoy a private 8 hour tour from Osaka in a private vehicle with your English/Chinese speaking driver. Visit Osaka, Kyoto and the Nara area. There are 2 types of cars available including a mid-sized passenger car or a mini-van. Both have heating and air conditioning systems, and are also equipped with Wi-Fi. This is an easy, culturally-enriching bus trip from Osaka to Kyoto. 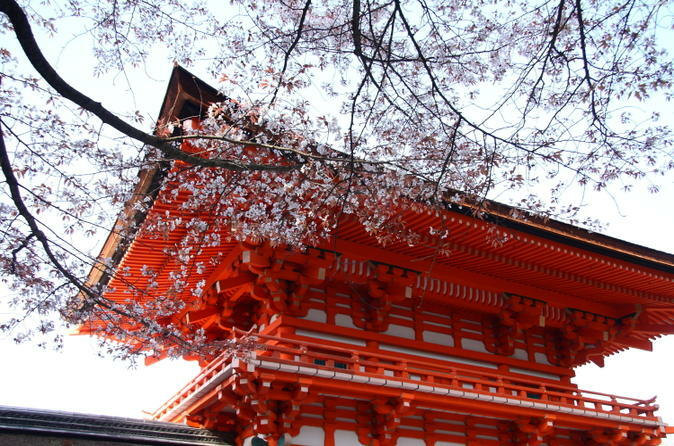 The tour stops at the Fushimi Inari temple and the UNESCO world heritage sites, the Kiyomizu-dera temple and the Kinkakuji temple. There are several convenient pickup locations nearby hotels in Umeda and Namba. 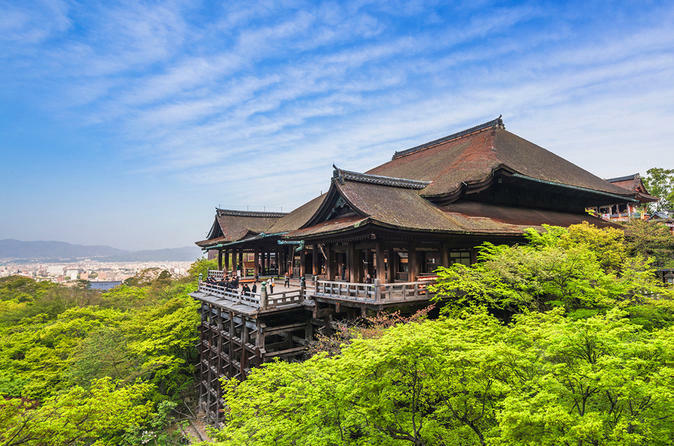 For tours between May 1st and October 1st a 3-hour visit to the Kiyomizu temple is included. Adventure out of Osaka for the day and take a 12-hour trip to see Kyoto, Nara, and Kobe with an English-speaking tour conductor. Visit sites such as Kyoto Arashiyama, Nara Todaiji Temple and Park, and the Kobe Mosaic and choose from two convenient meeting points located in Umeda and Namba for tour pickup. Board your bus for a culturally-enriching and fun filled day. Tour buses can seat up to 42 passengers, which will provide you the opportunity to make new friends and memories. Travel round-trip by rail to Kyoto and visit key cultural landmarks in the former capital. 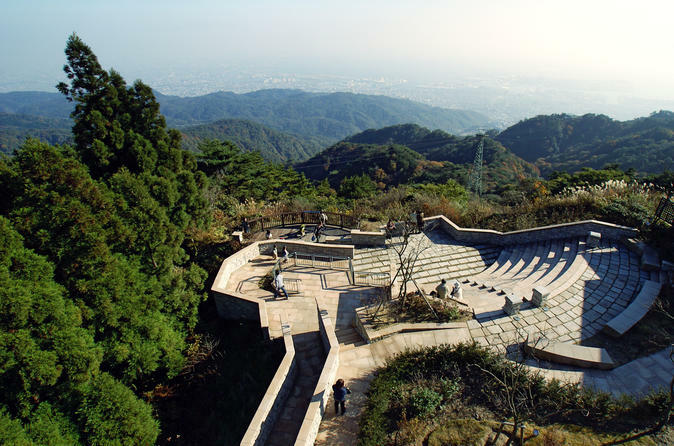 View the splendid gardens of Heian Shrine, see 1,000-armed statues at Sanjusangendo Hall and take in beautiful panoramic views from the UNESCO World Heritage-listed Kiyomizu Temple. Aboard a comfortable coach, you’ll explore these iconic sites with a knowledgeable local guide who informs you about the city’s rich religious heritage. 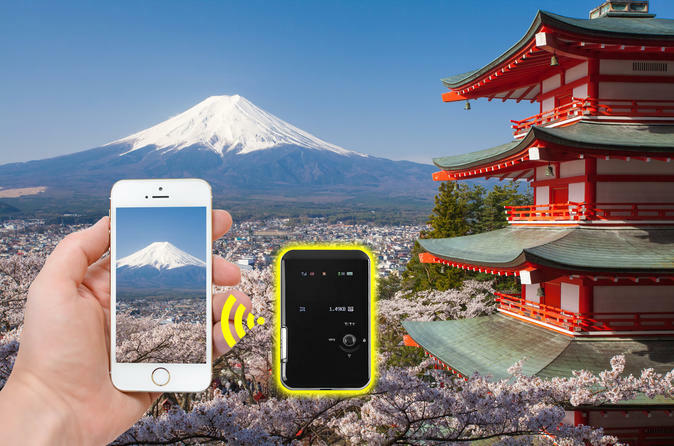 Reserve the fast, reliable, and unlimited mobile WiFi hotspot that provides you with internet access on the go in Japan! Convenient pickup and drop-off at Kansai International Airport, also called Osaka Airport, and never worry about international roaming charges ever again. One hotspot can connect up to 10 devices so you only need to rent one to have your entire family or group of friends covered. 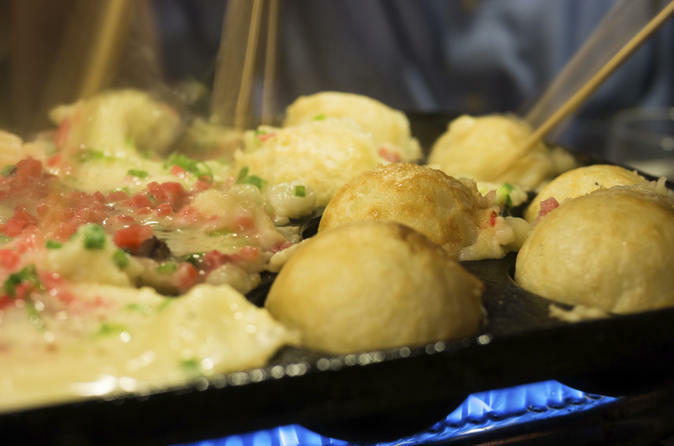 Enjoy the best street food experience with a professional local guide on your private tour. 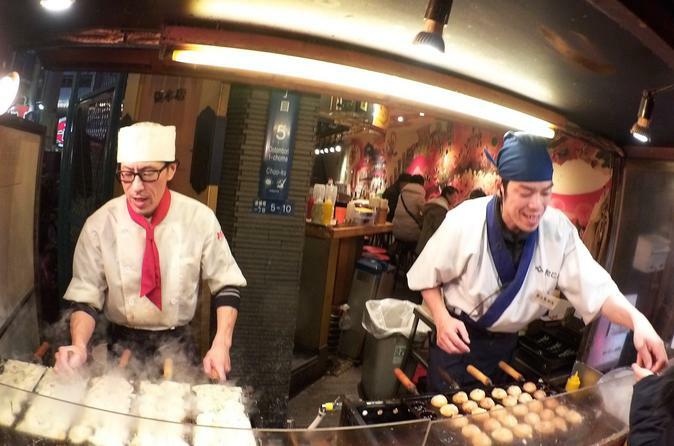 Osaka, the city of merchants, is the place with the nickname “the kitchen of Japan” since it has long been the center of the rice exchange market and was the logistic hub during the Samurai age. The unique atmosphere and culinary culture of Osaka remains unchanged even today after around 300 years. In the evening, neon billboards light up every corner of the city. You will have a chance to experience this local way of life as you hop around the street food stands and restaurants. In ancient times, a journey to Mount Koya, long considered one of the world’s most sacred mountains, could take several days on foot. These days, you can see the UNESCO World Heritage site on a day trip with provided transport (by rail, bus and cable car) from Osaka. 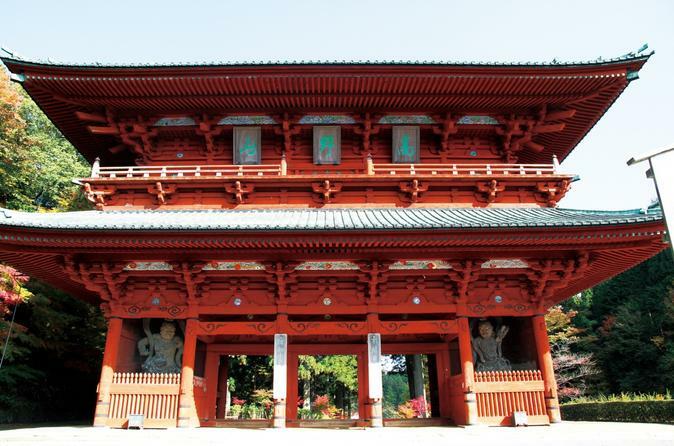 This famed Buddhist retreat on the Kii Peninsula is home to more than 100 Buddhist temples. After an authentic Japanese lunch, your guide leads you to Okunoin and Danjo Garan, two of its most beautiful temples surrounded by stunning pagodas, Buddha statues, gates and mandalas. Osaka is a bustling city chock full of "big city" things to do, but there's another side to it as well. 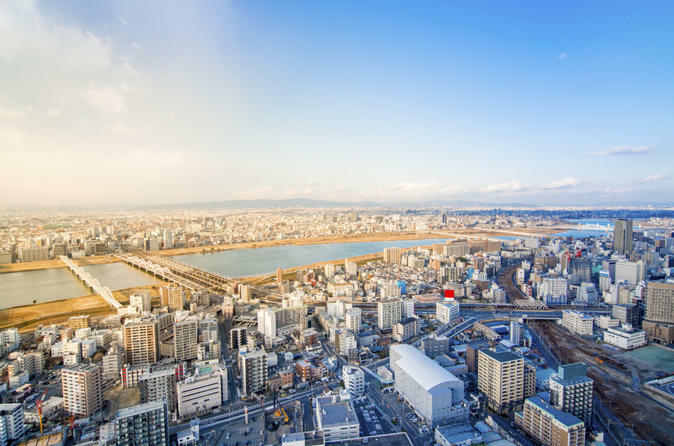 This tour takes you from your hotel to notable temples, a historic entertainment quarter, gardens, and the famous "kofun" tombs in Osaka and south to Sakai City, all in a private, luxury vehicle. Your native or equivalent English-speaking driver/guide will ensure the trip is light and fun, while also keeping it intellectually stimulating and informative in a well-rounded, accessible way. An optional Osaka Castle Park add-on is also available. As this is a private tour, discussions about changes to the itinerary are welcome! Depending on your request, additional charges may apply. 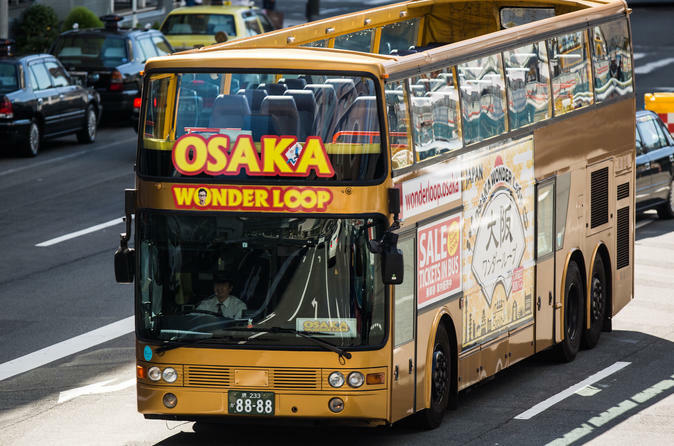 See Osaka at your own pace by bus and cruise with this 2-Day hop on hop off tour. Explore Osaka's most popular sights, such as Osaka Castle, Shitennoji Temple, Shinsaibashi, Umeda, and more. Choose between 1 or 2 day subway passes to assist you in getting around the city. Leave the hustle and bustle of Osaka behind, as you are whisked via highway in a luxury car to the mountains that rise above nearby Kobe. 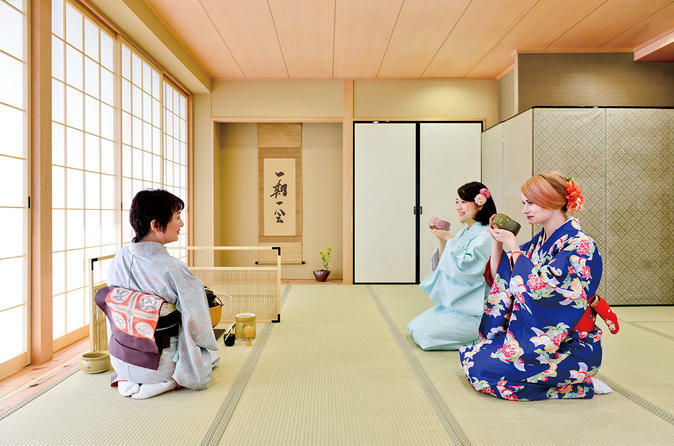 Over the course of your private tour, you will ride a historical cable car, visit impressive gardens and a hot spring at Arima Onsen, with a native (or equivalent) English speaking guide providing information, insight, and fun. This is your tour if you demand both the big sights, as well as a walk on the local side. Your guide will be a native English speaker who also speaks Japanese, guaranteed. The first stop on this 4-hour walking tour is Osaka Castle Park. The castle itself is beautiful on the outside, and in a lovely park. You'll also take in some nice views and be able to immerse yourself in nature. Next, it's off to Osaka's famous Koreatown, which is actually fairly Japanese at this point, but more importantly a vibrant slice of old Japan. This is a known local shopping neighborhood with open markets galore. From there, the tour visits southern entertainment quarters, Tennoji and Shin-Sekai. 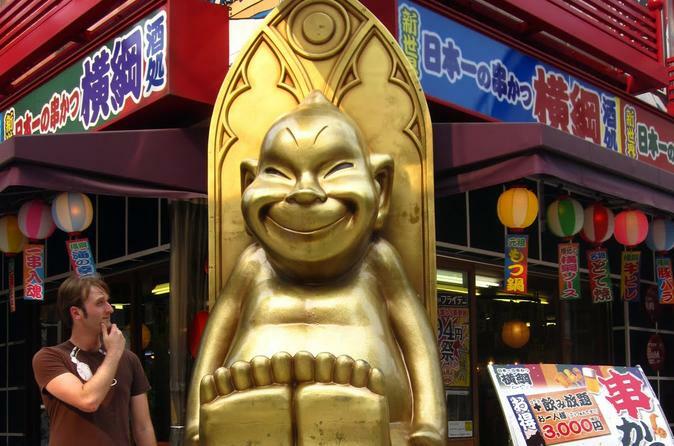 Finally, a Shinsaibashi to Namba exploration, ending near manga nirvana. Here, you can catch the famous "running man" scene at Dotombori, then end the tour in an even deeper Namba area, in the cooking supplies district. 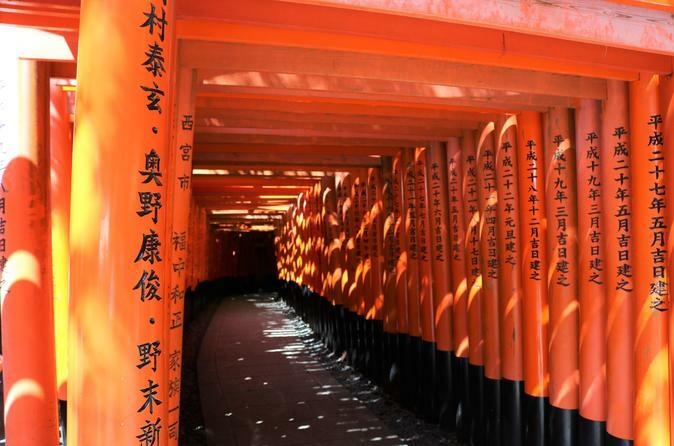 Explore the sights of Arashiyama and Fushimi Inari on this full-day private tour from Osaka. Explore the famed red gates of Fushimi Inari and visit the UNESCO World Heritage Site of Tenryuji, known for its beautiful architecture, serene garden, and pond. After strolling through a bamboo forest, enjoy a kaiten (conveyer belt) sushi experience at a local restaurant. 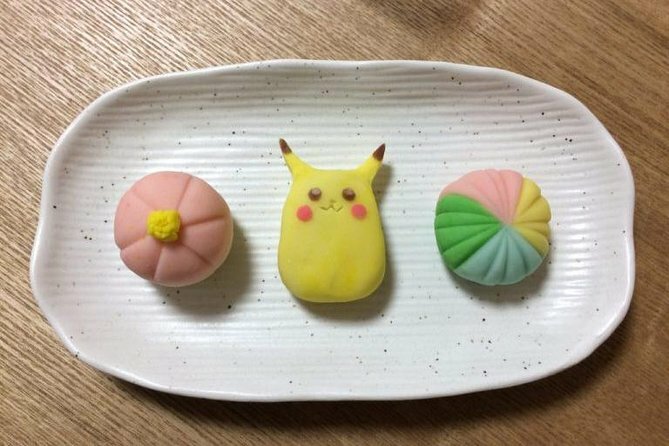 A unique sweets making and wagashi cooking experience in Osaka that will make your travel memorable. You will make Japanese sweets called nerikiri ideal for taking back home as a souvenir. Your host will kindly explain in English and demonstrate how to make delicious Japanese sweets. These sweets can be adjusted for the season or your favorite shape or character. See Osaka your own way by chartering a private vehicle. Choose a limousine, van, or bus, and create your own 8-hour sightseeing tour. 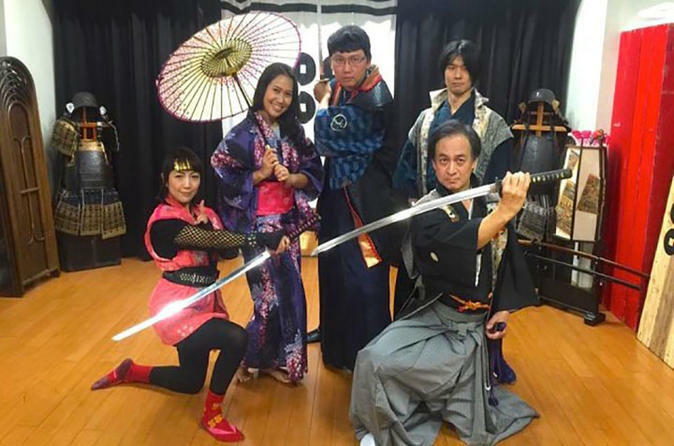 Learn about Japanese history at Osaka Castle, soak up the views from the Umeda Sky building, and see where the local nightlife happens in the Dotonbori district. A driver is included and, if you wish, you can upgrade your tour to include a guide. 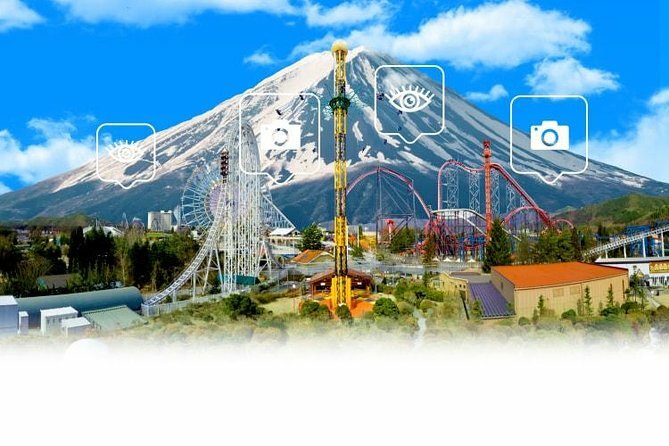 This is a one-day Studio Pass for Universal Studios Japan™ in Osaka! Here, you'll be able to experience what it's like behind the scenes of your favorite Hollywood movies at one of the only two locations in Asia. 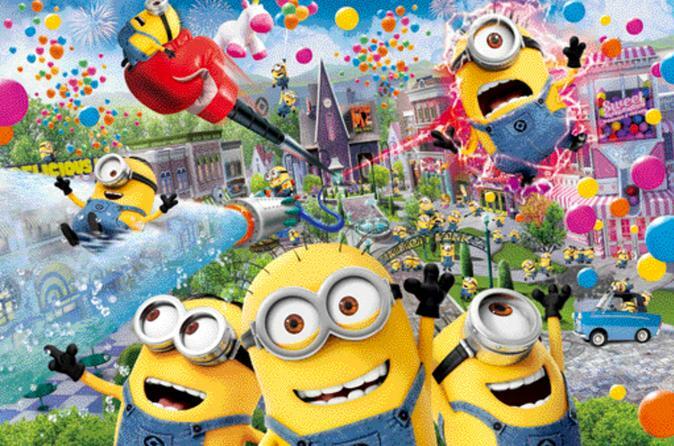 You will be able to enjoy attractions like the Despicable Me Minion Mayhem, The Amazing Adventures of Spider-Man - The Ride 4K3D, Jurassic Park - The Ride®, Jaws® and Terminator 2:3-D. You'll also be able to experience the magic at the Hogwarts ™ castle and Hogsmeade ™ village in The Wizarding World of Harry Potter™. Osaka, which has a 1,500-year history as the "water capital," was the center of Japan between the 16th and 19th centuries. 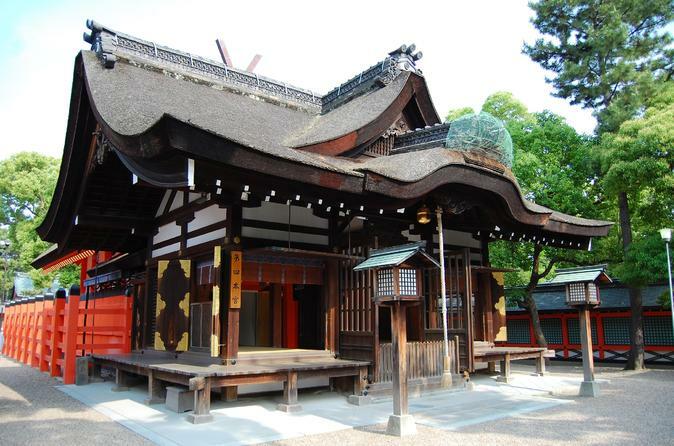 Osaka was also the home of Hideyoshi Toyotomi, the father of the modern Japanese unification. You’ll get to visit his castle, the Osaka Castle, and learn why even today Osaka has a great appeal and is still known domestically as the nation’s kitchen. While Tokyo may be the biggest city in Japan, Osaka has always flourished as a center of the Japanese economy. 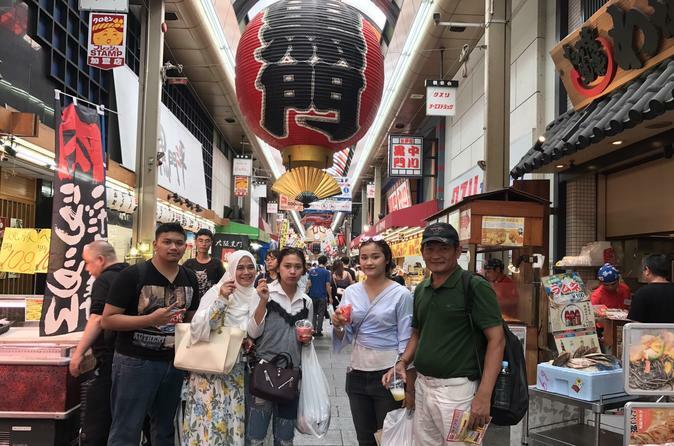 Today’s visitors to Japan, in addition to exploring Tokyo and Kyoto, should not pass up the opportunity to explore the bustling metropolis of Osaka! 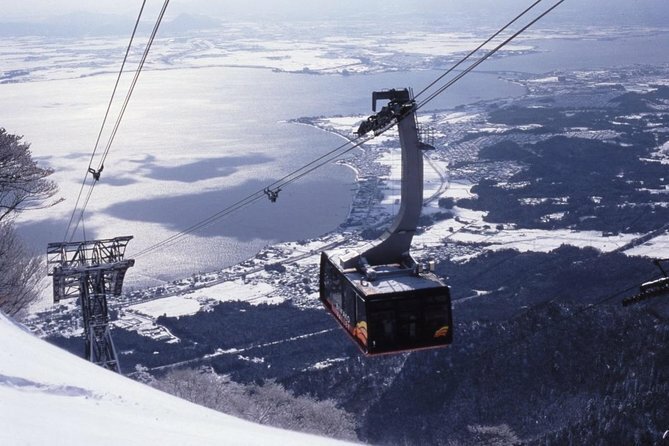 Take a day trip from Osaka during your stay to the snowy mountains of Biwako, only two hours away. With this bus tour, you'll be able to enjoy a day in the snow with family and friends! 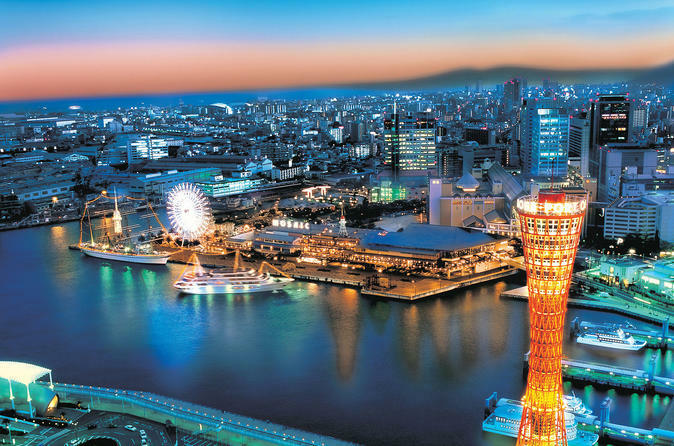 Visit one of the world’s largest aquariums, Osaka Aquarium Kaiyukan, and ride a replica of the ‘Santa Maria’ around Osaka Bay on this half-day tour, led by an informative guide. At the aquarium's Pan Pacific exhibits, get up close to a Japanese giant salamander at the Japan Forest, an adorable sea otter at the Aleutian Islands, and a ring-tailed coati at the Gulf of Panama, among other creatures. 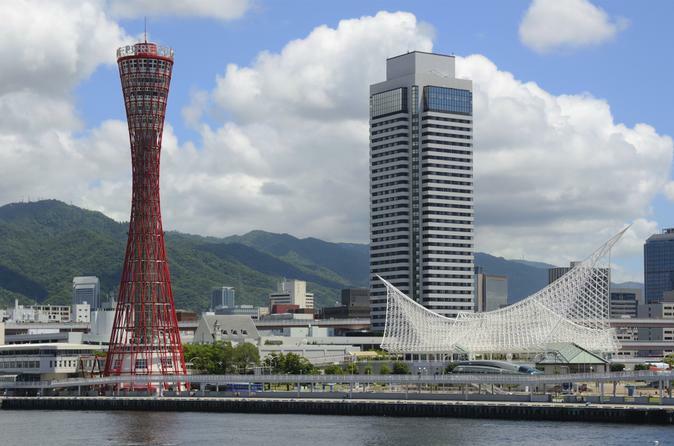 Then board your sightseeing vessel for a journey past Osaka landmarks around the bay. 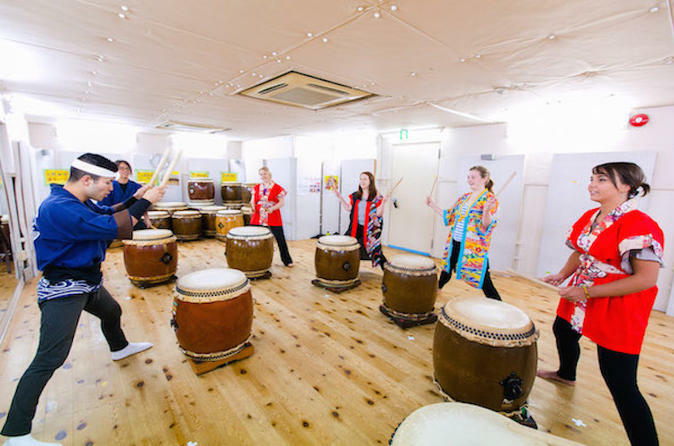 Book the 1-hour traditional Japanese drum "taiko" class in Osaka! Taiko developed through the long history of Japan along with various traditional art forms such as Noh, Kyo-gen, Nagauta, and Kabuki. Wadaiko especially refers to a taiko of Japanese origin. It is a compound word, which consists of "wa"(Japanese) and "daiko"(a suffix of the word "taiko"). Your professional and friendly English-speaking instructor will show you how to play Japanese traditional song with Japanese drum. See the best of Kobe on this full-day walking tour. You’ll learn about one of Japan’s largest cities, known for its sake and vibrant street culture. With your guide, take the train from Osaka to Kobe, where your immersive walking tour begins. You’ll spend the day walking Kobe’s historic districts and scenic waterfront parks, enjoying a Japanese and Western-style mixed buffet lunch and sampling sake. This is an affordable yet culturally-enriching bus trip from Osaka to Kyoto and Nara. The tour stops at Kyoto Arashiyama and Nara park Todaiji temple with time for lunch. With several convenient pickup points near hotels in Umeda and Namba, this 9 hour tour will be a great addition to your trip to Japan. Inunakisan hot springs are located within only 40-minutes from Kansai International Airport which is a gateway to West Japan. 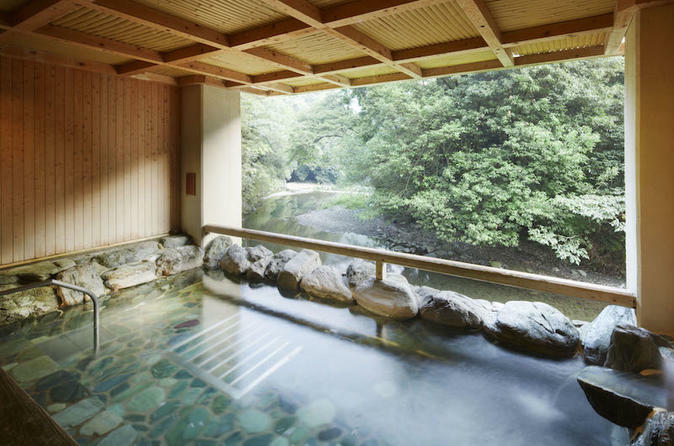 You can get clear and baby smooth skin by bathing in Inunakisan hot springs where are served in Janpanese inn, Fudouguchikan. And you can taste ‘ Kaiseki’ lunch, a course of beautifully prepared Japanese cuisine. After lunch you also have a chance to experience Japanese Cultures that you want. Our English, Chinese or Korean-speaking tour guide will attend you friendly. 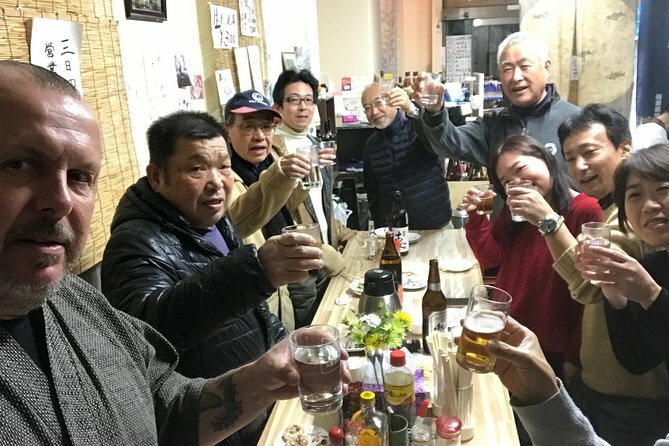 This tour is concentrated on Sake alone and drinking with locals. We will meet outside of Osaka about 20 minutes so we can go to LOCAl places. We will stop at three places. The trip includes multiple types of sake to try, appetizers at each stop and dinner at the end in a Japanese Tappas Gastropub. Fun with the locals!